Good morning! And how was your Christmas? Was Santa good to you? Today is Boxing Day, a holiday celebrated in Canada and in other parts of the Commonwealth. It's origins go back to the days when those in service to the aristocracy, would get a day off after having to serve their masters on Christmas day. They would be allowed to go home to their families and would be given a "box" of gifts - gratuities, clothes, food, etc. to take with them. It evolved into a day to give to the less fortunate - giving "boxes" to charity, but has now, unfortunately, lost all nobler meaning and become a day of after-Christmas sales and corporate glee! I refuse to shop on Boxing Day, and instead, I took it as it's original meaning. Having served my family the whole holiday season, I refused to move a muscle, took the whole day off and let the hordes fend for themselves! Nowadays, I pass that secret on to my daughters, so they can continue the tradition!! I have a new product suite to debut for you today! It's from the new Occasions Catalogue that goes live January 4th and it's called Urban Underground. 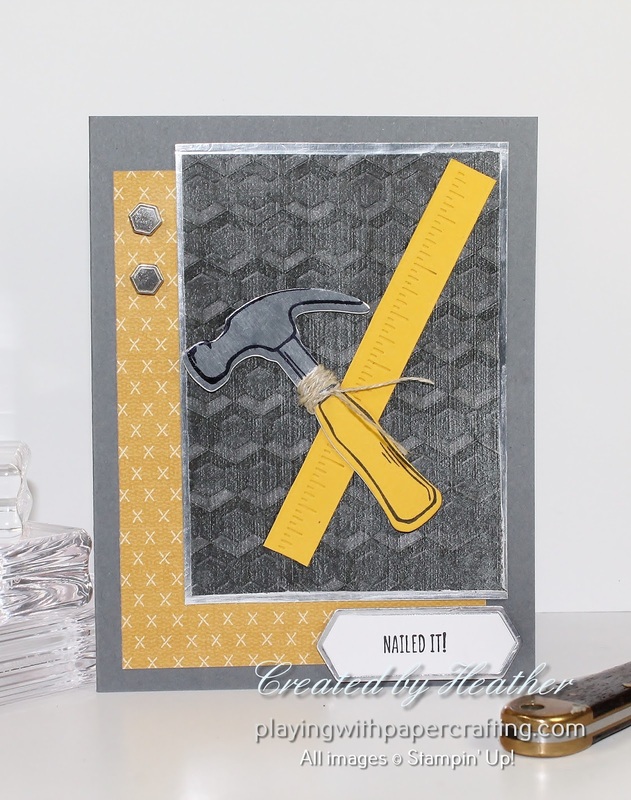 The products I used to make this card are the Nailed It stamp set**, Build It Framelit Dies**, Urban Underground Specialty Designer Series Paper**, Hexagons Dynamic Textured Impressions Embossing Folder** and the Urban Underground Embellishments**. It just so happens that this card is the subject of a photo tutorial that all those who are signed up to receive my monthly newsletter will receive for free in the January 2017 issue. The photo tutorial contains step-by-step instructions with detailed photos along with a list of all products used and measurements. 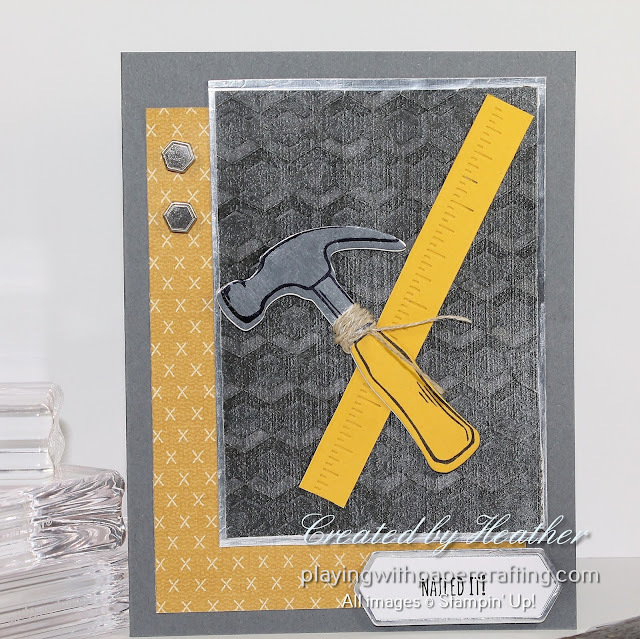 This card will teach you the basics of Paper Piecing as well as how to use the Dynamic Embossing Folders. It's easy to receive my newsletters. Simply type in your email address below and click on GO. I know how annoying it is to receive a flood of emails from a business, so I send out 1 email a month. The only exception is if Stampin' Up! comes up with a big sale that I am not able to catch with a regular email and I think you will really want to know about it. This does not happen often. You can also unsubscribe at any time without difficulty. I want you to notice the Designer Series Paper under the hammer and the ruler. It has been embossed using the newest Dynamic Textured Impressions Embossing Folder called Hexagons**. This works just the way the Cable Knit Embossing Folder did from the Holiday Catalogue. Learn how to get the deepest impression in my tutorial. Don't you love those manly embellishments? And the dies for the tools? We've been needing these for a long time. These products are going to be your 'go to' ones for all the masculine cards you have to make this spring! Alright, Ladies! Get out there and enjoy your Boxing Day! Put your feet up! Get your craft supplies out! Do exactly what you want to do today! You've earned it!